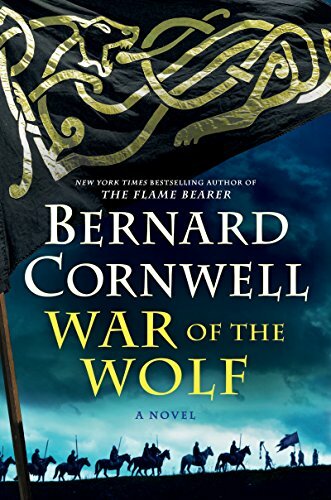 War of the Wolf is the latest novel in the Saxon Tales series by renowned author Bernard Cornwell. If we were to use a baseball metaphor, we would say that the master of historical novels just hit another homer! It is masterful and intriguing! The author skillfully integrates actual historical figures with his fictional characters. Few authors are able to this as well as this author does. Cornwell ties it in rather nicely to his previous ten novels in the Saxon Tales series. Thus, readers who have been reading this series will well understand its place in Cornwell’s history of the establishment of Saxon England begun under Alfred the Great (871–899 CE). At the same time, book enthusiasts who have not read any of the books in this series will not only enjoy reading this book, but in all likelihood will check out their local book store or go online and purchase the first volume, The Last Kingdom. In an earlier book in this series our hero, Uhtred of Bebbanburg, had given his oath to Queen Aethelflaed of Mercia. She, however, was now dead. (She died in the previous 10th volume, The Flame Bearer.) Her brother, King Edward of Wessex, under the guise of paying homage to his deceased sister, attended her funeral with a large number of troops. After the funeral they never left. Edward and his troops all stayed. After co-opting several of the thanes King Edward proclaimed himself Anglorum Saxonum Rex, King of the Anglos and Saxons. This did not sit well with some Mercian thanes. The result was a rebellion of sorts by those loyal to the dead Queen Aethelflaed. The rebels wanted the queen’s wishes of succession to be fulfilled through her daughter. At the same time, other parts of what was not yet a unified England were inhabited by Danes who seized this opportunity to raise havoc. They were aided in their quest by Norsemen who were being driven out of Ireland. They wanted land on which to settle. The villain of this tale, Skoll, is not to be satisfied as he wanted to be King of Northumbria. What follows is an exciting tale with many twists and turns, which if described here would most certainly ruin the story for the reader. If, however, this is the first book in this series you read, after finishing it you’ll urgently seek out the first book in the series, The Last Kingdom. Reading the first in the series will only serve to whet your appetite for all the other volumes to catch you up to date. Unfortunately, there is a down side to Cornwell. He has written several stand-alone books also. If you read any one of them you will wish he wrote a follow-up volume. As noted previously Cornwell is a master craftsman. In addition to developing his characters superbly, he also references numerous historical facts, such as the Roman road network throughout Roman Britain, fortifications, architecture, and to a lesser degree culture. He concludes his manuscript with a brief Historical Notes section in which he tells the reader how actual history and the novel agree and differ. So what can be said about volume 11 of the Saxon Tales series, War of the Wolf? Read it and enjoy!